I think it's safe to say that we have a pressing need for marketing cycling positively if we're to encourage people to ride bicycles and begin the transformation of our cities into more liveable places. Instead of scare campaigns about cycling [a life-extending, healthy, sustainable transport form], wouldn't it be more appropriate to begin campaigns about the dangers of automobiles? Many people in car-centric countries no longer regard cars as dangerous. Maybe they realise it, but the car is such an ingrained part of the culture that the perception of danger rarely rises to the surface of peoples consciousness. 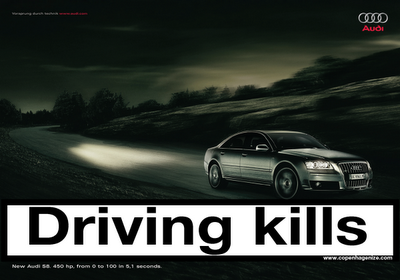 Sure, there are scare campaigns for cars out there, but what if we just cut to the chase? Much like smoking. Only a couple of decades ago, cigarettes were an integral part of life, whether you smoked or not. That has changed radically. We think that we could borrow freely from the health warnings now found on cigarette packs around the world. In order to be thorough, we asked a doctor a couple of years ago whether or not the health warnings on cigarettes could be directly transferred over to health warnings on cars. The answer was a resounding "yes". Every single one. Removing the status associated with driving is something that is slowly evolving in this, the age of Demotorisation. Speeding that process might be a good idea. We don't even have to mention bicycles, because it's not all about that. It's about reducing societal harm caused by car crashes, harmful emissions and noise pollution. "The number of global road fatalities, using WHO’s annual figure of 1.2 million, since the swine flu outbreak was first detected (using a very rough benchmark of a month ago)? 98,630." In Denmark, 4000 people die every year because of the health hazards related to cars - and that's ten times greater than the number of people actually killed in car crashes. Respiratory illnesses, heart disease, stress-related illnesses caused by noise pollution, etc. Very few people are aware that the levels of dangerous microparticles from exhaust are actually higher INSIDE the car than if you're cycling next to it. 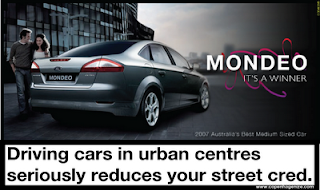 So let's focus on this fact and hopefully encourage motorists to think twice about their last-century transport form. Where is the legislation dictating that 30% of the surface area of cars must feature health warnings? Just like cigarette packaging rules in the European Union. There are a variety of smoking texts that can be applied to the car health warnings, so we save time and money right there in not having to think them up. And so on. Wikipedia has a comprehensive list. Seriously. 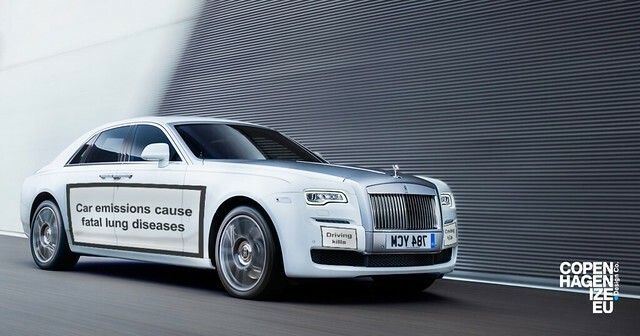 Imagine carmakers having to plaster 30% of the surface of each side of the car with health warnings. On the sides of trucks, the message would be massive. Imagine the impact it would make on the public psyche. If we think practically about implementing this idea, certain clauses would be necessary. 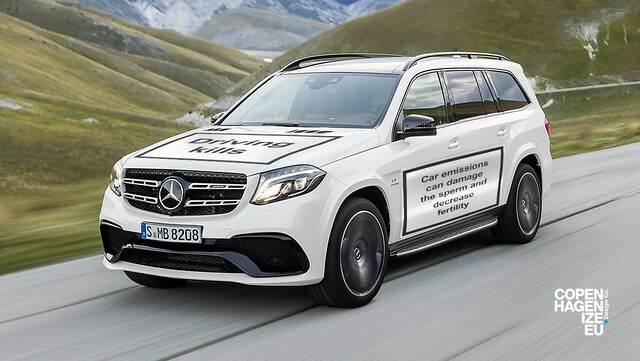 Electric cars would not need to be plastered with the "Dangerous emissions" warnings, just the ones about how driving kills, etc. 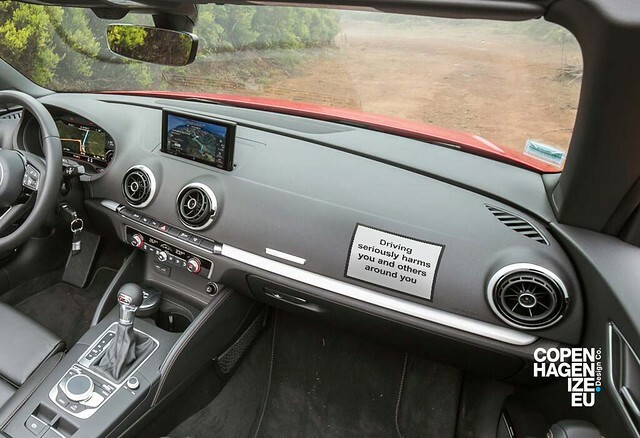 In the first phase car owners would be able to purchase large stickers with heavy duty adhesive and in various sizes depending on their vehicle. Using reflective material so the warnings are visible at night would be a good idea. A little cottage industry would pop up, with companies offering to stick the warnings on, while you wait. Consumers could choose from a list of approved warnings instead of just being stuck with whatever they're given. 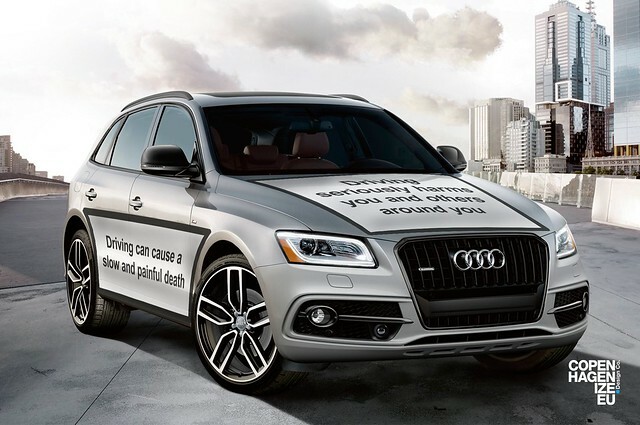 In time, carmakers could implement the warning labels directly into the design and paint job of the car, as long as they adhere to the directive's requirements for size and font. Public transport companies would benefit and they could propose targeted warnings that would benefit trains, busses and even bicycles. This BMW advert, above, is a fine example of how bicycle shops could enjoy increased sales. Ok. Kidding. It's a creepy ad from BMW. If there is a fee involved with purchasing the stickers for your car - which there should be - the proceeds could go to planting trees in cities, to charities dealing with obese children or illnesses caused by car pollution. A good idea whose time has come. Coupled with mandatory motoring helmet laws, we'll well on our way to the demotorization of our cities. Addendum: We've learned that a similar proposal - not quite as logical as the above - was discussed in Brussels with high-ranking members of the EU government. Back in 2008. Not much came of it. Then a reader sent us this link to a health-warning proposal back in 2007.